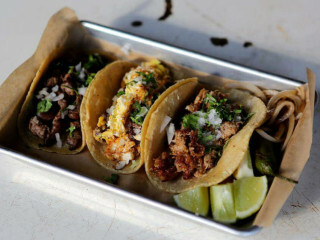 Taqueria La Ventana, the taco concept from Dallas-based Firebird Restaurant Group, has two new locations in the works: in The Market at Dallas Farmers Market, and in Addison, at 4180 Belt Line Rd. The original Taqueria La Ventana is the walk-up joint adjacent to Meso Maya on McKinney Avenue, on the edge of downtown. The Dallas Farmers Market location is slated for an early summer opening. Unlike its predecessor, which has outdoor seating only, this one will have 21 indoor seats in addition to 28 on the patio. There also will be additional seating in the common dining area, which it will share with previously announced restaurants such as Rex’s Seafood and Market, Stocks & Bondy, and Palmieri Cafe. The Addison branch will be the biggest: a 2,344-square-foot restaurant and bar seating 60 inside; a 945-square-foot patio will have room for 32 diners. The taqueria will share real estate with fellow Firebird concept Snuffer’s, which is relocating from Midway Road. No target opening date was announced. Tacqueria La Ventana’s menu features everyday Mexican street tacos and chef-driven tacos, as well as burritos, salads, churros, and beer and margaritas. It’s open for breakfast, lunch and dinner.